Let’s kick the new year off right — with a new SynCast! This time we’ve got stuff about South Sudan, fracking, MOOCs, and carnivorous fish. Also: What it means to live a hip-hop life. Enjoy! Alas, the news this morning is not all joyous. In fact, I’m focused right now on two really horrible stories, one from a while back and one happening as we speak. Desperate to know more, I went to Hassan’s Wikipedia page and read about her ordeal. It turns out no one knows, to this day, who exactly killed her. Some group of fanatical scumbags. What I found truly remarkable, however, is that some members of the Iraqi insurgency — and even Abu Musab al-Zarqawi — called for her release. As horrifying as the whole ordeal is, this last bit gives me hope, in a weird way. I am comforted by the fact that an atrocious person like al-Zarqawi, who was responsible for so much suffering and violence, was willing to stand up for an aid worker. It helps me feel like religious extremists aren’t a totally alien species, beyond all human connection. It’s a small thing, I know, but it really hit me. Meanwhile, reports of other atrocities are coming out of Central African Republic. Alas, there’s nothing we regular folks can do at the moment. The UN is sending in 6,000 more peacekeepers (around 12k total) to try to quell the fighting. So what do we do? First of all, we pay attention. Indifference is the greatest sin, and while of course we shouldn’t fixate on the horrors of reality, neither should we hide from them. Secondly, we allow ourselves to feel the empathy so natural for humans (and so rare in our modern society, alas). Third, if and when some sort of action is possible (via Amnesty International for example), we take it. The news is filled today with images of South Sudan soldiers, emaciated refugees, and terrified children. But it seems like those are the only images we ever see from Africa. (cf. How to Write About Africa by Binyavanga Wainaina.) 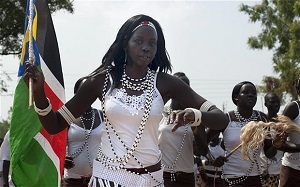 So I chose an image from the 2011 South Sudan independence celebrations. Let’s not forget there are many awesome people in that country working hard to bring peace back. 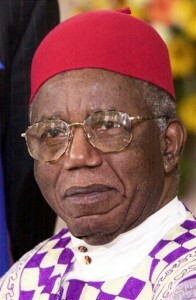 Chinua Achebe died today at the age of 82. He was a great writer; probably the most important African writer of the 20th century. To learn more, please read the Wikipedia Featured Article about Mr. Achebe. It is remarkably well-written. Seems like the only thing I post here lately is the SynCast. Hopefully during the summer I’ll have more additional text and stuff to post. Anyway, enjoy this week’s show!